Under the assumption that every company has dishonest employees, businesses have to be aware of the tricks and tactics employees deploy to cheat attendance. Time cheating is a crime by law particularly when it involves civil servants. There are cases where people jailed for attendance fraud; hence employees shouldn’t take attendance cheating lightly. To avoid all forms of attendance cheating from happening, one must know the ways these people cheat. This is perhaps the most common attendance cheat where one person clocks for his friends, who promised that he’d return the favor next time around. Because this cheat is so easily done, buddy punching is rampant amongst employees who are using punch time clock and some card systems that do not require any other authentication of the owner. Punch clock or card system is not dynamic, it cannot tell the difference between cheaters and honest workers. Now you see me, now you don’t. This is the kind of employee who lets you think that he is available when in fact he is not present at your company doing the job he’s supposed to do. This employee ‘clocks in’ and yet he’d go somewhere else to complete his errands and come back to clock out and get paid. This scenario commonly occurs in an environment where door access activities are not monitored and the workers can enter and exit as they please. Biometrics system, even though unique and personalized, has its flaw too and once employee discovered the flaw, they tend to exploit. It’s usual for a company that’s using fingerprint system to recommend a user to register two fingerprints for one user ID; one to be used regularly and one as a backup in case of something happen to the first finger. To cheat the system, two good friends would share one User ID (with the permission from the admin, of course. When this happen, admin should be held responsible for fraud). For my user ID, one finger is mine, another is yours and for your user ID, we do the same. The system is not wrong, the people are. Biometrics system has improved leaps and bounds; so one fingerprint is enough for one user ID. Or, a company can impose a policy whereby any administrators caught jeopardizing the system could be heavily punished. When employees are assigned to work outside of the office, how confident are you that they are on the job most of the time? Some would carry out the task for an hour and spend another 2 hours doing other things and claims for 3 hours. And there are some who didn’t even go but claim anyways because you simply have no proof of anything. To avoid this cheat, TimeTec Mobile has a solution for you. Explore now. These are the workers that clock in late but not THAT late and clock out early but not THAT early. They are living on the edge (so to speak) and in the end; it will cost you inflated cost because of the short additional minutes here and there, every day. 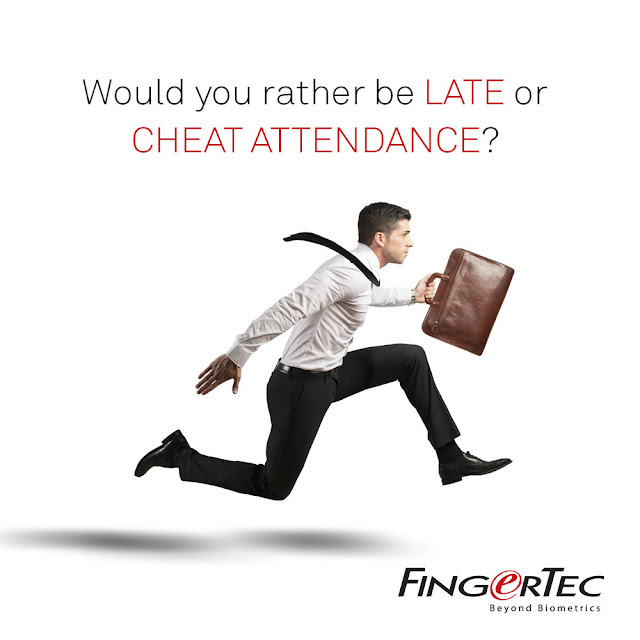 Take charge by implementing a great attendance system that can manage those discrepancies and monitor your cost efficiently. We Go Wireless with NFC and Beacon Technologies! When this company started at the start of the millennium, biometrics technology was a novelty. The oohs and aahs of discovering a new technology, and the market were instantly attracted to the level of security biometrics had to offer. Fast forward 16 years, the market is still very much excited about biometrics solutions because it provides exclusive authentication of every user with the use of fingerprint and facial recognition like no other security technology could. According to a recently released TechSci Research Report “Global Biometrics Market By Type, By End Use Sector, By Region, Competition Forecast and Opportunities, 2011 – 2021”, the global biometrics market is projected to surpass $ 24.8 billion by 2021. The market for biometrics is still fairly large and continues growing. In tandem with biometrics popularity however, other technologies also are making their way into the market share, and gaining tractions from the developers, system integrators and users alike. NFC and Beacon are the two technologies riding the wave of BYOD, bring your own device and the iOT, Internet of Things concept. Both are using the smartphones to read information transmitted by the devices installed all around. The utilization of these technologies is highly dependent on the developers’ objectives, and for FingerTec, we keep our focus intact in the workforce and security industry, adding options for our customers to choose. The first product to be deployed at TimeTec with NFC technology is TimeTec Patrol mobile app solution at www.timetecpatrol.com. The Patrol app is designed to read the signal transmitted by the NFC tags via the smartphone and transmit the data back to the cloud server for information. The NFC tag is first loaded with information during registration that is useful for patrol solution and each tag is unique for reference. Patrol routes are determined for patrolling guards to know the direction of their duty and they are responsible to report incidents back to the post to ensure safety. 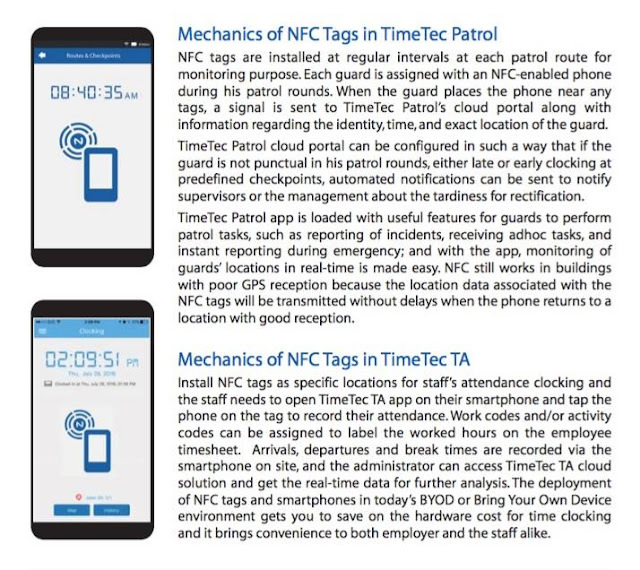 By having these NFC tags installed along designated routes, patrolling guards are instructed to tap on each tag on that route in the given time provided and report incident encountered instantly via their smartphone and all information will be pushed to TimeTec cloud server for instant access of information. In brief, the NFC technology enables real-time monitoring and the deployment of this technology is affordable by utilizing the readily available smartphones, the mobile app, the inexpensive NFC tags and the convenient cloud solution. TimeTec Patrol app will be available around the corner for security practitioners to benefit from. FingerTec will then move on to NFC attendance for TimeTec TA and the initial research on Beacon technology has been carried out to assimilate this technology into our product portfolio. Technology evolves and we have to move with the trend and time in order to penetrate into new market and to provide various options to our customers. There are various elements to be considered in the development of a certain technology, and mobility, accessibility, convenience as well as affordability top the list of yays that we need to achieve with NFC and Beacon technologies. 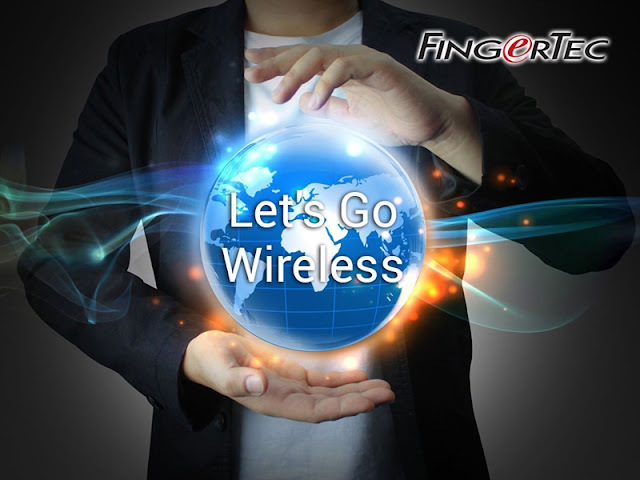 As usage of smartphones and Internet gets worldwide, tapping on wireless technology is definitely inevitable. Follow our FB page FingerTec Worldwide and subscribe to FingerTec Newsletter for NFC solution’s announcement soon.